TOKYO (Reuters) -- Airbag supplier Takata Corp. and Japanese carmakers including Honda are locked in the commercial equivalent of a bad marriage -- not entirely happy in each other's company but unable to break apart and wary of potentially costly court battles. Honda on Friday unveiled a new model with an unusual sales pitch -- fuel efficient, lots of cargo space and, by the way, no airbag inflators made by Takata, the Japanese supplier at the center of a global safety crisis that has rocked both companies. Over the past five years, recalls have ballooned to include 36 million vehicles fitted with potentially lethal Takata airbags, triggering a criminal investigation and lawsuits in the U.S., and testing ties between Takata and its main customers, bankers and auto executives say. Automakers don't normally discuss supply arrangements for components such as airbags in their new models. But in a departure that underscores an increasingly strained relationship, Sho Minekawa, Honda senior managing director, said the new Shuttle wagon sold only in Japan would use inflators from Takata's rival, Daicel Corp.
"We use very little from Takata for our domestic models and that's been the trend in recent years," Minekawa said in response to a question at the launch of the new car. "There was a time when we used a lot." The uneasy dynamic explains why Japan's automakers have not been agitating for a shake-up or even restructuring at Takata even as they give new contracts to other suppliers. The automakers need Takata to supply replacement parts for urgent repairs and cannot demand compensation that would endanger its ability to do so in an industry where no rival could readily take up the slack. A court battle could risk embarrassing disclosures about the responsibility of automakers in reviewing Takata's designs or in pushing for cost cutting, a banker who has been in contact with Takata said. "The most important thing from the perspective of the automakers is that they can ensure replacement parts are being supplied in a stable fashion," said Masaki Higurashi, deputy director of the automobile division at Japan's trade ministry who is involved in coordinating the government's monitoring of the recall crisis. Any discussion of restructuring would have to wait until after that, he said. "After all the replacement parts are supplied, the automakers have to decide whether to let Takata stay on as it is," he said. "I think the automakers are starting to think about that." Honda, still Takata's largest customer, recalled almost 5 million more cars last week after concluding the Takata airbags they contained were at risk of exploding in accidents. Toyota Motor Corp. added another 5 million vehicles to the tally and Nissan Motor 1.5 million. Six deaths, all in Honda vehicles, have been linked to shrapnel from defective Takata airbags. 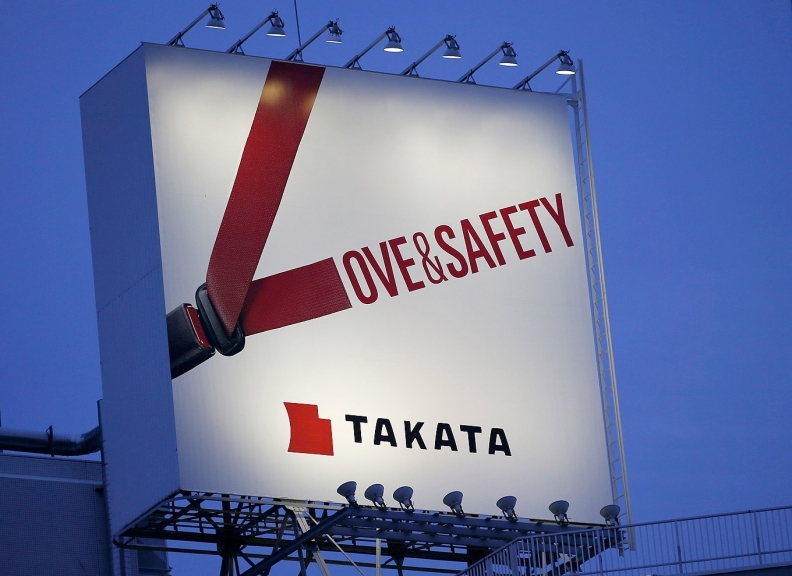 Problems with Takata airbags have also been linked to more than 100 reported injuries. The Japanese automakers and Takata failed to agree on whether the most recent recalls were necessary based on data provided by Takata. As a result, there is no agreement between Takata and the automakers on how to split the costs, representatives of both sides said. That will have to wait until after they have determined why Takata airbag inflators are breaking down. Takata will not be able to go it alone. The new costs could be as much as $1 billion if all vehicles covered by the new recall were repaired and the $100-per-car estimate favored by analysts applied. By comparison, Takata's market value is a little over $1 billion. Takata has allocated $520 million to cover recall costs. At a meeting with analysts on Thursday, CFO Yoichiro Nomura said Takata had asked automakers to allow it to pay its share of recall costs in installments, a concession that would allow it to avoid a potentially destabilizing charge, according to analysts who attended the closed-door briefing. Takata CEO Shigehisa Takada, whose family controls some 57 percent of the supplier, did not attend the meeting. Nomura told attendees the CEO was busy with quality issues. Honda is using a Takata competitor, Toyoda Gosei, for driver's-side airbags for its new Accord sedan in North America, two people with knowledge of that move have said. Toyota is no longer among Takata's top five customers. Even so, one purchasing manager at a Japanese automaker involved in the recalls, who asked not to be named, said the companies were forced to rely on Takata given its 20 percent plus global market share. He said: "We have no choice but to stay together."